Jars of double-rich chicken broth made from Orange Circle Farm‘s flock, will serve as the basis of many a warming meal this coming winter. Along with canned tomatoes, these are a must for stocking my pantry with. 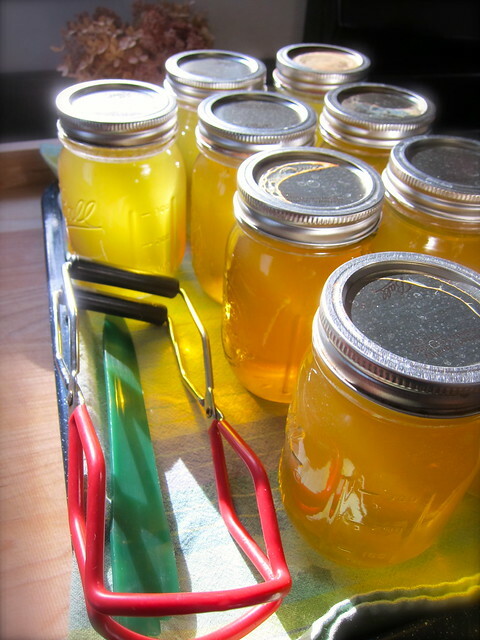 Canning tips: Add 2 tablespoons of white vinegar to the pressure canner to prevent the filmy build-up of minerals from hard water on your jars, also known as scaling; defat the stock before filling jars to ensure a better seal and avoid rancidity; and make sure to remove the rings after processing and that the jars are clean before storing. After that, it’ll be like having my shelves filled with gold. This entry was posted in cooking, local food, preserving and tagged broth, canning, chicken, poultry, stock. Bookmark the permalink.